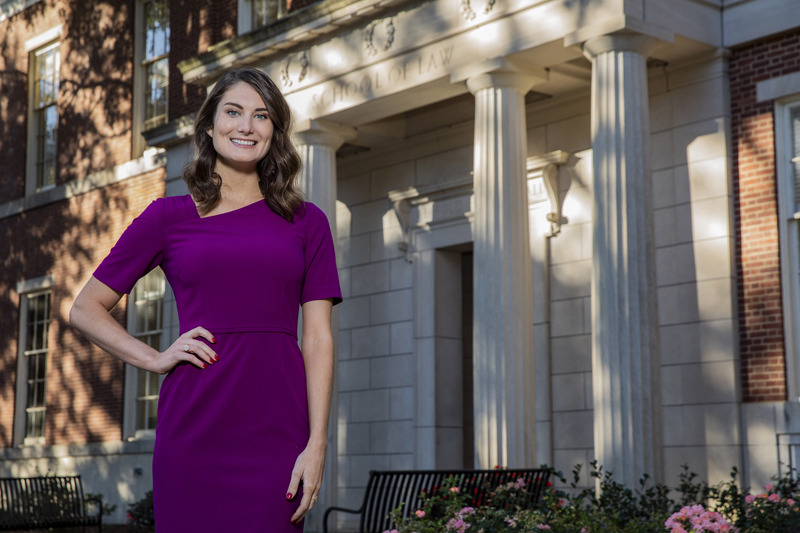 Law student Erin Munger’s passion is the fair and equitable administration of justice, and she’s committed to maintaining the rule of law and the integrity of our legal institutions. … I felt it presented me with the best opportunities to reach my goals. In the Honors College and in Law School, I have consistently been provided with the opportunities I needed to succeed. Plus, I love SEC football and there is nothing like a game between the hedges. These days, I spend most of my time in the Law Library! But I enjoy spending time in the Founders Garden, walking around North Campus and reading on Herty Field. I enjoy singing and dancing. In undergrad, I was part of With Someone Else’s Money, UGA’s premier co-ed a cappella group. I also enjoy going to OrangeTheory Fitness and hot yoga. … participate in an exchange student program with a high school in Germany at age 15. … the main section of the Law Library. … run for the U.S. Senate. … spend a few years abroad, especially in Asia and Africa. My passion is the fair and equitable administration of justice. I am drawn to public service and eventually intend to pursue a career working at the intersection of law and government. Whether I spend my career as an advocate, or transition into a different legal role, I will remain committed to maintaining the rule of law and the integrity of our legal institutions. I have accepted a two-year clerkship with a federal judge at the U.S. District Court for the Northern District of Georgia, Atlanta Division. After that, I have accepted an offer to join the litigation group at Eversheds Sutherland in Atlanta. My time at Delta Hall in Washington, D.C. The Honors in Washington program was an incredible experience, and I had the opportunity to work for UGA’s Director of Federal Government Relations. Getting to advocate on behalf of the university I loved was very rewarding.